The Front Page 4 widget area in the Imagely Chic demo uses a Text widget including a list of images, but you may use any content you wish. Go to Appearance > Widgets to add a Text widget to the Front Page 4 Widget area. To configure the widget, click the title bar to open if necessary, then change the settings as desired. Title: Enter a title of your choice (i.e. 'Featured In' or 'Awards'). Content: Using the 'Add Media' button select/upload an image and insert it to the text editor. You may add as many images as you wish; our demo has 5 images. 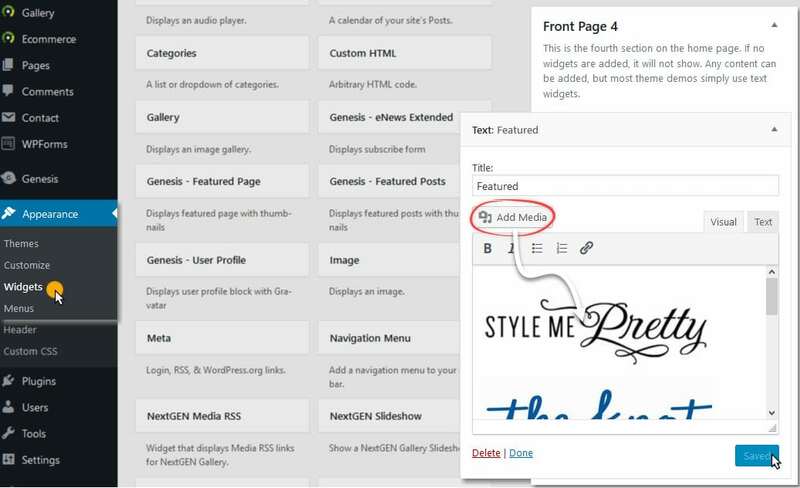 We recommend that you resize them before you upload them to your site. A height of about 60px would work well if you have more than 3 images.